The Waves Will Wonder What Hit 'Em! 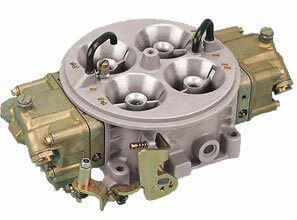 Holley high-performance Marine Carburetors are designed to meet US Coast Guard specifications. Each Holley Marine Carburetor is built with a fuel metering system that is calibrated to compensate for a boat's unique engine load. J-style vent tubes provide safe operation by directing fuel and fumes back into the carburetor while on rough waters. All marine carburetors, except the 1050 cfm Dominator models, have a 5-inch airhorn.